Believe it or not, the Moon’s got a case of the asteroid munchies! Because of this, you’ve been tasked with using the gravitational field of nearby planets to collect orbiting asteroids to gain mass, racing the clock. Oh and depending on the level, gravity can be your best friend, worst enemy or… both. 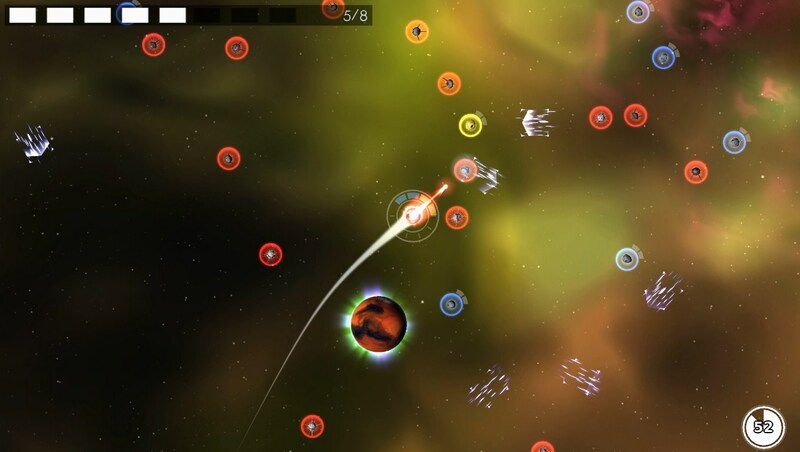 One planet, a bunch of asteroids and simple velocity-based puzzles. That’s how things start out, and for a couple of levels, everything’s smooth sailing, no obstacles or hazards to cause trouble. But then one by one, all kinds of crazies are introduced, making each level (and planet!) more complex than the next. Asteroids that travel in a predetermined direction and momentum-killing asteroid clouds are some of the things you’ll have to deal with early on. They pale in comparison to how Venus, Earth, Mars and the rest of the lot mix things up though! See, while you’ll be gobbling up asteroids to reach a certain mass no matter the planet, each of these actually with a twist or two, entirely their own. Venus has you controlling the Moon by fuel-based ‘drifting’ (in lack of a better term), Earth lets you expand and shrink its gravitational field for some genuine slingshotting, and and then there’s Mars, my favorite by far, along with Jupiter, Saturn, Uranus, Neptune, Pluto in that order. Here [on Mars], all control is taken away from the player, causing the Moon to move entirely on its own. Recipe for disaster? You bet ya, if not for the fact that you’re given the means to blow stuff up (albeit with limited ammunition)! All it takes is a clear path to your target, a steady aim, and… KABOOM! Not like you needed that gold asteroid anyway, right? Unfortunately ya kinda do, as collecting 20 of these is the only way to unlock the next planet, which is where the fun factor went from ‘woohoo!’ to ‘less-than-stellar’ in my experience. Going for the gold in a handful of levels wasn’t much of an issue, and there were even those that I gladly replayed to net all three. There are however more than a few which require pin-point precision, where one mistake can literally cost you the gold. I’m sure that with a bit more patience and practice, I’d be able to unlock everything, but alas, I threw in the towel after finishing the Mars levels (hence ‘impressions’, as opposed to ‘review’). I did get to experience Mercury, Venus, Earth and Mars prior to finding myself unable to progress however, and man did we have a good time. Well, maybe not so much Earth, as I kept crashing into it… but aside from that. 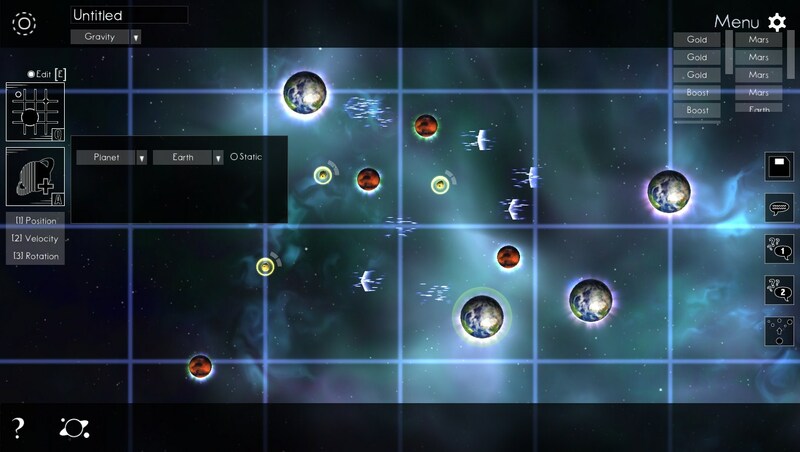 Those who’d rather design than play are in luck, as Luna’s Wandering Stars comes with a fully featured level editor (shown above), making it incredibly easy to create your own puzzles and share them online. According to the game, you can only use it “if you’re careful” though, which is probably due to the fact that it lets you go nuts with planets, asteroids, mines, wormholes and other potentially universe-changing things. Basically, you get to become an omnipotent being, deciding the fate of millio– nah, but it does have serious potential, on top of being very user-friendly. Overall, and aside from the level gating issue, I’d say the game is enjoyable and as such, an easy recommendation. Oh and each level is narrated by a faceless being known as ‘Read Me’, who pokes fun at the player with lines like “If you learned from your mistake, then it wasn’t a mistake.” upon failing a level. Clever. Note: Luna’s Wandering Stars is IndieGameStand’s current PWYW deal (23 hours left) and part of The Debut 12 Bundle (81 hours left). 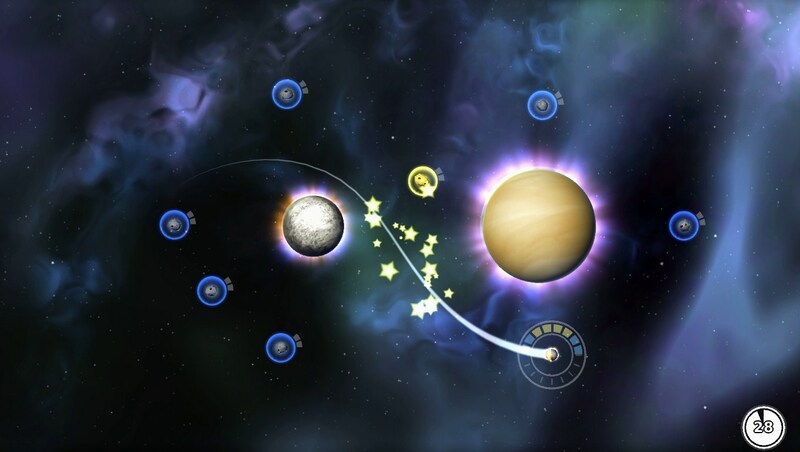 Luna’s Wandering Stars is available DRM-free for Windows and Mac from Desura, IndieGameStand, GamersGate, ShinyLoot and direct (via. Humble Widget), priced at $9.95. What say we get it through Greenlight, eh?